A big thanks to all of your nominations for your favorite Etsy items and shops. 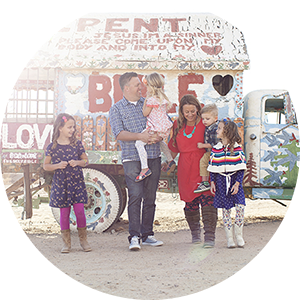 I loved discovering new sellers and found so many new things to heart. I will be featuring shops every Friday so be on the lookout for some Etsy love. The winner of the Urban Chiks fat quarter is Bethany of Vermillion Rules. She sent a bunch of faves, all which I am tempted to spend my precious Paypal account on. Loveyduds makes these gorgeous and comfy looking baby carriers. I rocked the Baby Bjorn with Halley and a Hotsling with Lucy, but I have been seeing more and more of this style around lately. Two of my friends swear by them. Next time around I just might give one a try. Some of my best childhood memories are of family camping trips in our VW bus. I wish my parents never sold it! I would paint it turquoise and go to the beach in it every day during the summer. 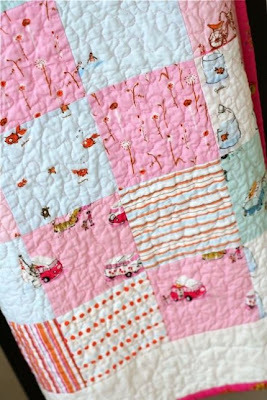 Nettiepete sells gorgeous quilts and for the adventurous crafter kits to make your own like this one. 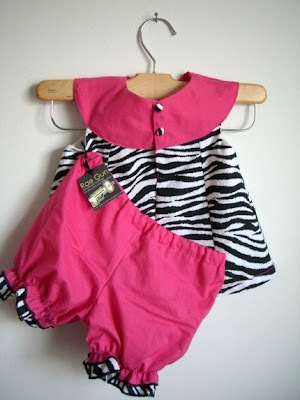 Raegun has fun and funky clothing for the little ones. This dress would be so fun on Lucy with it's sassy collar and zebra print. Perfect for my wild girl. I am exited to hear you will be sharing fun new Etsy finds with us! YEAH!!! And that carrier is CUTE! Although I don't think it is the best idea to have another baby just so I can have one!! HA HA HA! I'm so excited!! Thanks so much-I'll keep checking back to get ideas for new Etsy shops to shop at! !